Times are changing, with suburban Edible Estates, healthier school lunches (thanks to Edible Schoolyards), and now a White House South Lawn transformed into a bountiful vegetable garden patch. This is true progress, eco-citizens! In recognition of this great moment in presidential greening, our good friends at TheWhoFarm, are encouraging kids of all ages to write a thank you letter to First Lady Michelle Obama, as a sign of appreciation for her efforts to freshen up the White House agenda, and the American diet, with a cornucopia of organic veggies and homegrown goodness. Not since Eleanor Roosevelt’s Victory gardens during World War II, have we seen prime DC real estate used for fresh vegetable cultivation. Now, as thanks for Michelle Obama’s groundbreaking effort, TheWhoFarm has created a letter-writing campaign for kids as a means to coordinate a joint thank you to our First Lady. Write letters with your fellow classmates in a science, history, writing, or art class, as well as at summer camp or with siblings at your own kitchen table. a fun history lesson (Eleanor Roosevelt’s Victory garden and Wilson’s sheep included); and a call to action, in the form of letter writing, poetry, drawing, etc. TheWhoFarm (aka The White House Organic Farm Project) began as a ‘non-partisan, petition-based initiative to respectfully request that our 44th President oversee the planting of an organic farm on the grounds of The White House, our nation’s First Home, at 1600 Pennsylvania Ave, Washington, D.C. On March 20, 2009, the petition request was honored. 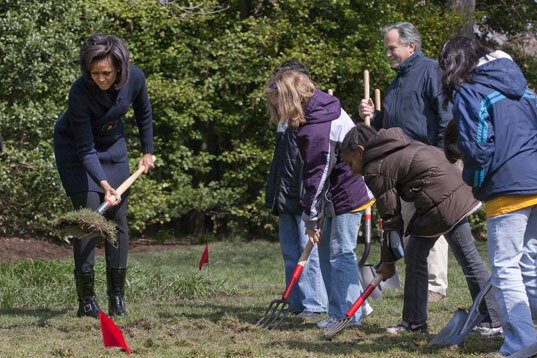 First Lady Michelle Obama broke ground on the White House lawn, with the help of over twenty 5th graders from Bancroft Elementary School. Spread the word, your thanks, and the seeds of sustainability by joining in this nationwide letter writing initiative. Many thanks to Daniel and Casey at TheWhoFarm for their amazing efforts in this campaign.